Making a paper kiln is relatively easy, and the firing process is particularly exciting and interesting. I am not so sure as to the origins of this type of kiln, but I would guess it is a fairly modern experimental approach, providing an alternative firing/smoking technique to the more traditional processes. We have done some experiments with paper kilns, and I would not recommend them as an alternative to more controlled forms of firing (traditional kiln) and definitely not as a stand alone firing for exhibition pieces or works you are really keen on. 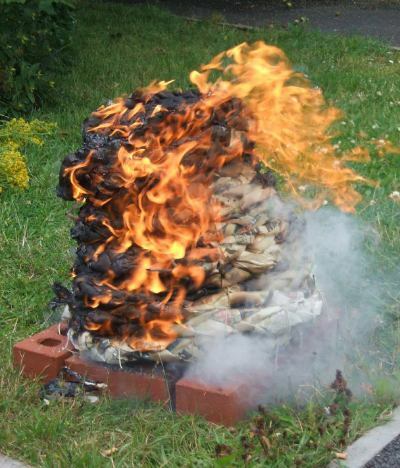 However, a paper kiln firing offers various possibilities in terms of smoking and provides for experimentation with different materials and is undoubtedly a very valid educational exercise. As a general rule, I would recommend bisque firing the ware first and then paper firing it. Burnished pots provide for very interesting results! If you do not have access to a kiln, use a very open clay body, with plenty of grog, make sure the ware is as dry as possible and limit the size of your models. Small pinch pots and compact animal figures tend to work, but be prepared to pick the pieces! I am not sure about the temperature this kiln fires to. I would reckon it is something over the 400 degrees Celsius, and it burns for a relatively long time before collapsing on itself. The kiln continues to smolder and for best results, allow the kiln to cool down naturally. I have left such kilns over night in the College grounds (check fire regulations in your country, even though the "fire" is very much controlled here) and there were still embers the following morning! If you are making this with kids allow 1 to 2 hours to make the kiln, another 1 to 2 hours to pack it and to fire it, until it collapses. The kiln is a nest-like structure made from rolls of newspaper or old paper. The size will depend on the amount of ware you want to fire in one go but do not be too ambitious. It is better to have two smallish kilns than one bigger one. Using the largest newspaper sheets you can get hold of, roll individual sheets diagonally, forming roll which are about an inch in diameter. Use masking tape to keep rolls from unfolding. Make plenty of these! Have students plait/braid these. Make each plait as long as is comfortably possible, inserting rolls into each other to make the plait longer. Form the base, a flat circular shape made from the plaits. Build the walls of the kiln, using the plaits, sticking them in place with more masking tape and string. Do not be tempted to use glue! Bring the walls up to the required height and then make a lid, similar to the base. It can either sit on the walls or fit inside. Pack the kiln, with layers of ware and any other material to fill in the spaces. We have experimented with paper, dry leaves and twigs, seaweed. Tie twigs or other material round your pots. Mask parts of the pots; sprinkle with salt or just use your imagination! Pack the kiln solidly and close with the lid. Move the kiln to the firing site and light from the bottom, from 3 or 4 different parts. Smoke should start coming out the lid, as the kilns starts burning slowly, bottom to top. The kiln will hold its original shape for a long time but at a point, it will collapse neatly on itself. Allow the kiln to cool down naturally before removing the pots. Do not be tempted to remove the pots immediately. BE CAREFUL – the pots will be very hot indeed! If the pots break (and this happens often enough) you can put the pieces together with glue or in some more imaginative and creative manner. Collect the ash remains for ash glazes. The key is to experiment. Do not give up if it does not work the first time round but I can assure you it is still worth trying this out.